This subject feels on the mark for today, and I found the writer’s quiet tone reinforced her idea of return to a quieter place, a nature-filled one. The essay also seems to subtly imply that sustainability on a personal level requires an inner shift as much as movement outdoors–finding a quietness inside. Rosemary, thank you for your reflection. The heart connection is difficult to ascribe and I’m pleased you caught it. Faye…interesting to think about how our childhood experiences in nature may effect our commitment to climate change in adulthood. i had a friend next door who just visited from florida… we were talking about how much we enjoyed exploring “down by the lake” as kids. i remember sucking on the honeysuckle and finding birds nests with tiny blue eggs in them. My nephew who works for the U.S. wildlife and fisheries just wrote to his boss about how pleased he is that his 15 yr old son is now a committed fisherman…even forgoes his iPhone to go fishing with dad. So I’m feeling there may be hope for the next generation. What a lovely, generational story and such a sensitive and smart young man to realize how the I-Phone can impede his focus and calm as he castes and waits. He’s hooked! Having grown up in the city I can’t relate to playing in nature as an experience. I grew up using the streets made of concrete and asphalt and the games mostly sports that those invited. What will get younger folks to treasure nature and and our environment is a greater awareness and responsibility for preserving the gifts that they offer us. Dare I speak of the necessity for developing a sense of obligation. I take your point about obligation and believe we need both younger folk who lead with deep seated “heart” and those who take heart by following their moral obligation. I imagine that as a young boy on those concrete pavements, you occasionally looked up at the sky and took special note on clear days when the temperatures were just right for your game. You attended, for how could you not, given your devotion to the out of doors and engagement with environmental issues in the present. This conversation helps me to take note of the fact that it is through attentiveness, immersion, and connection that younger people will have heart and engage others of the obligation to take heart. Thanks for the reflections . The streets of Brooklyn where we played “Off the wall,Stoop ball, Jump rope, potchy”, and yes, Hide and go seek lacked the green grassy garden expances you mention from very different outdoor experiences. So how did we both end up loving nature and the outdoors. Of course we did go to the catskills some summers, swam at the beaches we got to by train. What’s missing in those early years may be what is appreciated when we”re lucky enough to own it. Of course, we were always outdoors growing up. No room inside. Outdoors is where you saw friends, played, wandered the streets. skated. So, I feel grateful that I’m able to enjoy the outdoors and nature and that the love of the environment has been transmitted to my kids. daily from us as we lament threats to our parks, our oceans and wonder how to make a difference. I like to think we make a difference at least to a few important people in our lives. Yes, I totally agree with your choice of the verb “transmit”, how we transmit out appreciation of nature through our behavior. I would say that you embody and live your love of nature every day, Sheila! 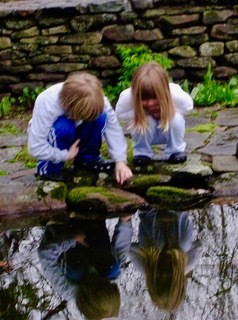 And yes, clearly you and Hy have imparted your love of nature AND concerns to your children. Yes, Sheila, I would imagine the contrast of those Catskills explorations caught your attention and nourished you in a special way given your joy and appreciation of the outdoors. Also the fact that so much of your engagement with others and the freedom to explore the streets, provided you with many opportunities to take in and absorb mother nature… for she is everywhere! thanks Faye. Nice reflextions that i was happy to reflect on in response to your blog. There’s a group of campers here this summer whose task is planting gardens with a goal of absorbing rainwater and removing polutants, putting in rocks and drainage pipes in order to keep the lake clean. Not only god for the environment but pretty. There ar people planting flowers everywhere. There is some good stuff happening. Let’s be grateful. Sheila, how exciting to be close up and to gain an appreciation of the camper’s effort to keep the lake clean. I would like to understand more about the plan to plant gardens in a specific way will help remove pollutants and keep the lake clean! Seems very forward thinking… would love to chat at some point about what you observe and understand! Yes, grateful for the idea of the effort. Kathi, never too late! I’ve been engaged with this topic for a long the but even more so now that I am a grandparent and we have a president who is oblivious to environmental issues. It is my deepest dream to combine outdoor settings and writing in the future. Hi Kat, I am excited to learn of your deepest dream and support you 100%. I adopted a practice called soul tracking when I had a therapy practice. I took people to a natural setting, did a brief meditative exercise and instructed them to mindfully engage with the trees, flora, around them until they were draw to one that resonated. I then worked with each person on what the connection evoked. Afterwards, we sat and wrote about the experience and read aloud, if it felt right. I can attest to so many rich and vital experiences which clients (and I) referred to afterwards in therapy.